It will take you longer to say the name of this appetizer than it will to either make them or eat them all. I had these recently at a friend's party, and that reminded me of a little snack I'd made at home a few weeks prior. She had stuffed hers with blue cheese, which I usually don't care for (yes, there are some cheeses I don't like), but when paired with salty bacon and sweet dates, it somehow just worked. And that's another benefit of these delicious little bites: you can stuff them with anything. Don't fancy cheese? I don't understand what that means, but stuff it with mango instead. Don't eat bacon? Wrap these in...ha, funny! Ok, fine I do understand that some people don't eat bacon. Don't wrap them. Dip them in chocolate instead. Don't like dates? Use figs instead. Or jalapeños. I told you: so many possibilities. Each pitted date uses one-half of a slice of bacon. 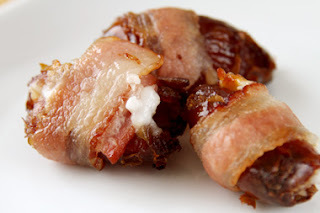 Stuff with a small bit of cheese, wrap the bacon around, and bake on a lined sheet for 15-20 minutes (until bacon reaches the crispiness you desire) at 350 degrees F.
Let them cool lest you burn your tongue. It takes longer to say the name than to write the recipe. Enjoy.